Schubert's Sonata in A minor in D. 821 (Arpeggione) has been arranged for cello and guitar by Valter Dešpalj, professor of cello at music academies in Zagreb and Liechtenstein. A graduate from the Juilliard School, Mr. Dešpalj studied cello under Leonard Rose and chamber music with Felix Galimir and the Juilliard Quartet. Mr. Dešpalj has performed all over the world, held guest professorship at conservatories throughout Europe, and been an editor of cello music with major music publishers. "It is not uncommon these days to hear a cello and guitar duo, but forty years ago it was quite rare. At that time, as a young cellist, I became intrigued by the idea of playing recitals with guitar accompaniment. The original repertoire was scarce, so I transcribed Schubert’s Sonata “Arpeggione”, along with some other shorter works. For me, playing this transcription was not only a great enjoyment but also a valuable experience. Hearing a subtle and delicate guitar accompaniment, which emphasized the intimate character of the music, inspired me to explore more refined nuances on my cello, nuances that could better match the sound of guitar and ensure a good balance between the two instruments." 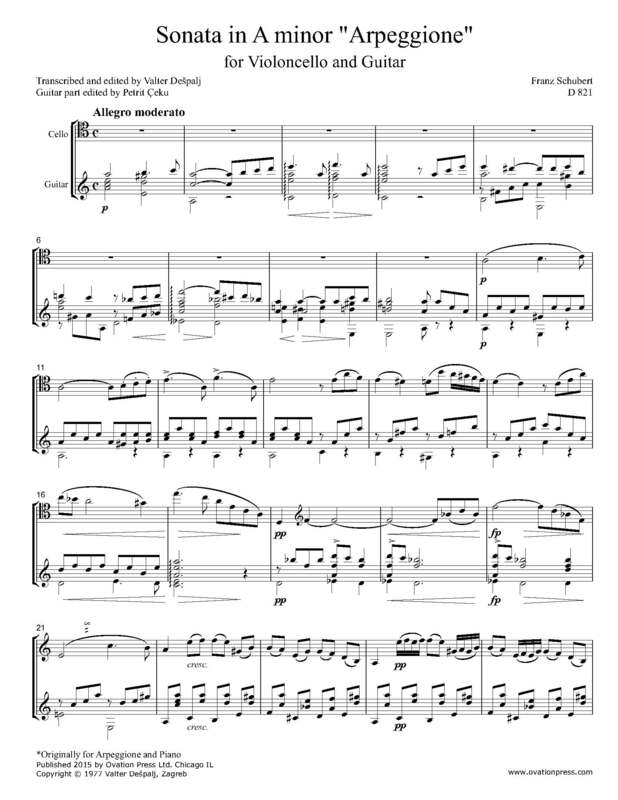 Download and print the score today to gain access to this expertly edited arrangement of Schubert's Arpeggione Sonata for cello and guitar by Valter Dešpalj!